YOU'RE BUSY AND STRESSED, so we took Mother Nature's best weapons against stress and put them in a convenient powder stickpack. Now busy moms, dads, professionals, commuters, or anyone else who is stressed out (and really, who isn't?) can enjoy relief from symptoms of stress and anxiety at any time - at the office, at home, at the worksite, on an airplane, or any place you go. 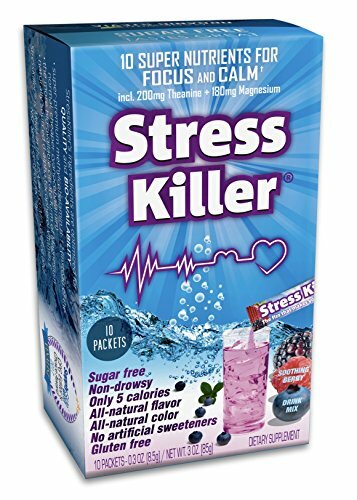 * vitamin C which has been found in studies to have "mood-elevating effects"
YOU WANT A COOL REFRESHING DRINK THAT IS SUGAR-FREE, so we sweetened StressKiller® with organic stevia and natural flavors to give it a sweet soothing berry flavor that has just the right amount of fizz and zing. You won't believe that it's sugar-free and only uses natural flavors. YOU WANT CONVENIENCE, so we made our stickpacks small and easy to carry with you to work, on a plane, in your pocket, or whenever you're ready to reduce stress & anxiety and increase focus & concentration. Just open the stickpack, add to 6-10 oz. of water, let it fizz, and enjoy the taste! STRESS KILLER WAS NAMED A FINALIST IN THE "BRAIN HEALTH" CATEGORY by the prestigious SupplySide CPG Editor's Choice Awards 2017. If you have any questions about this product by StressKiller, contact us by completing and submitting the form below. If you are looking for a specif part number, please include it with your message.